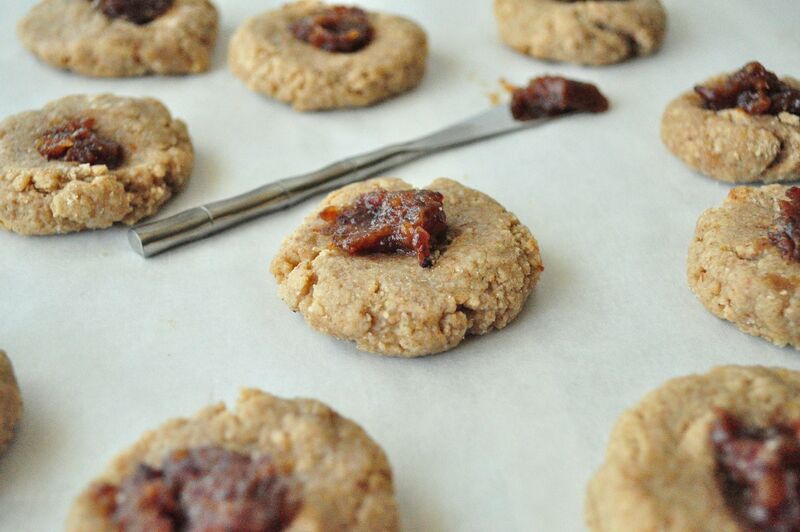 These Date Filled Thumbprint Cookies are so good! I seriously could not stop eating them! Let me start out by saying I love the thumb print cookie. I always have. I may, or may not have eaten 3-4 of them when they were done. Okay, I am lying. More like 4-5! They were just too yummy! I have made thumbprint cookies similar to this before. I have Cranberry Filled Thumbprint cookies on my blog already. This was the first time making thumbprint cookies in my vita mix. Previously, I had used my magic bullet. They came out so much better in the Vitamix. I had never even had a date until a few days ago. I bought them to make This Rawsome Vegan Life’s vegan raw snickers. Up until now, I thought they were similar to raisins. They are so delicious and creamy and not what I expected. In a blender, combine the almonds and the oats into a fine powder. Place that mixture in a bowl with the flour. Add all the wet ingredients minus the water in a bowl. In a food processor or magic bullet, mix the dates and a bit of water until they form into a paste and set aside. Roll the cookie batter into little balls and place on a lined baking sheet. Once all the balls are rolled, press them flat with your palm. Once all the cookies are flat, take your thumb and put a print in each cookie. Spoon a bit of the date paste into each thumbprint and bake in the oven for 11-13 minutes. What would be a substitution for the almonds? We have a nut allergy. Or how could I omit them and adjust the other ingredients? Thanks so much! Sunflower seeds would work well! is the batter supposed to be super dense and dough like? i mean, it was really difficult to mix.. i even added a bit of water to help and it was still like a bread dough consistency. The batter is on the thicker side due to the almonds and oats. Oh, they look good so... I would like to send their parcel to the friend for New year. :) How many they will be stored? Thanks! I got about 18 cookies? I store them in the fridge so they last the longest. To mail them, store them in an airtight container with parchment paper in between each row of cookies. Let me know how they hold up in the mail. I'm curious. I have made something similar gluten free. I used almond flour and added a couple eggs. I made my eggs out of flax meal, but you can use real eggs too. You can, but I would add an egg or two to help with the binding.